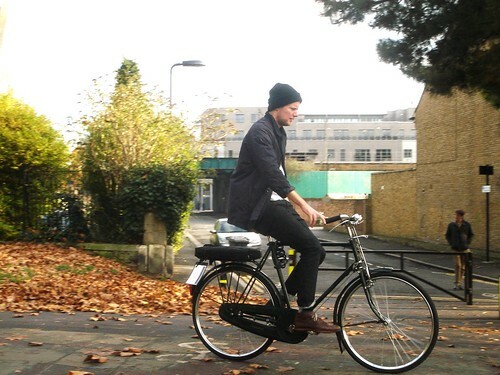 i b i k e l o n d o n: 101 reasons to love cycling in London #27 - go where cars can't! 101 reasons to love cycling in London #27 - go where cars can't! It's been a while since we really celebrated cycling here at ibikelondon towers and it's important to have some cheerful news in amongst the more toothy articles, and as I promised back on our first anniversary post it's time to get back on to 101 reasons to love cycling in London. For new visitors to the blog you can find the other 26 reasons so far right here. The fabulous 'ViewTube' cafe up on the car-free Greenway overlooking the Olympic Park developments? Bikes can do that! The quiet, lush, green backwaters of London's canals? Bikes can do that, too! The wide expanses of Hampstead Heath? You can go there on your bike, and if you fancy a swim in one of the bathing ponds you can park your bike right outside, rather than fighting for parking spaces with Highgate's finest 4x4s. A gentle spin up along the banks of the Thames from Hammersmith? Just lovely, and you can't go there in a car. Best of all you could do all of the above on a bike in a day - by foot it would take forever to get between them all by public transport. By car the congestion charge and the parking would cost a small fortune... I always think it's especially important for families that these spaces exist so parents can ride with their kids, and let's face it even us grown ups like to get away from the buzz of the traffic from time to time. It might seem like a small reason to love cycling in London, but it's important none the less and ranks at #27 in our list. What are your reasons? I love that too. Cycling through big parks and places like that is a great advantage for cyclists. And it's very peaceful too. I'm hopeless at giving directions to drivers, especially around Kingston which is full on one-way systems which simply don't apply to us cyclists as we can use lots of cross-town cycle routes! Speaking of one-way roads, you still can't cycle them in a wrong direction even if they seem empty and safe. Drivers that don't expect you are dangerous and in this case it is not their fault. Also, there is still a £30 fine for doing a bike salmon. 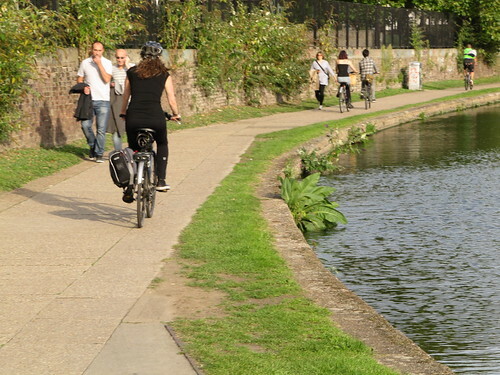 @Anna London has some great big parks and some have got good cycle routes through them too - it's fantastic to get some greenery and fresh air during a ride through the city. @Byrony Me too! I often get asked for directions, especially by pedestrians, which is fine. It seems people think cyclists know their way around. But when it comes to drivers I'm always like 'cut down this bike lane here, use this contraflow there' etc - not great if you are in a heffing great big motor! A lot of streets are becoming more and more permeable which is a good thing, but there's a long way to go! @Yuriy Whenever I ride to work I 'bike salmon' up Old Compton Street every day. It's a wide, quiet road and I'd rather take that slowly (always giving way to oncoming traffic and pedestrians of course) and risk a fine than cycle up Shaftesbury Avenue with all the buses! No fines or accidents so far, touch wood. Kensington and Chelsea, and the City of London, are making a lot of one way roads 2 way for cyclists simply by sticking "except for cyclists" signs on "one way" signs, so it's worth checking the signage as you enter a street if you are worried about getting a fine. I enjoy that here as well: there are some great places locally that car drivers know little about. Even better, the cycle routes are more direct than the roads, so I get where I need to go faster than I could in a car.